A quick feature on two music videos shot at our studios that made huge leaps and bounds in the music and video world in 2017. We recently had ABC Projects at our Brooklyn soundstage to shoot a new spot for Casper and their awesome new line of mattresses. Casper is an NYC based company that is known for eliminating the need for showrooms and creating an easy way to ship out there state of the art mattresses to their customers with a compact box at a fraction of the price. The shoot itself was fairly stripped down as far as the set design, placing it's main focus on the mattress with the use of a jib operator, some great NYC talents along with some diffused lighting techniques. Always love watching new businesses bring their work to life at our photo studio rental space! Check back soon for the final product. The setup consists of a homemade revolving stage with an infinity mirror built into the center, minimal lighting and some steady-cam trickery all enclosed by a panoramic projector screen displaying a slew of animations from 4 separate projectors stitching it all together. To add even more dimension, they created an epic low-fi wash over the entirety of the video with the use of an old VHS camcorder against the projections to create an endless feedback loop. It was Garrity's goal to capture the length of the video in as few shots as possible with the use of timing and some well executed choreography from the band. The end result is quite beautiful and trippy to say the very least. "In Undertow" is the first single to be released off of their new record, "Antisocialites", which is set to drop on Polyvinyl Records in early September. There's quite possibly nothing more refreshing than seeing two different publications come together to create something to celebrate a common bond. We had our friends at Paper and Posture Magazine join forces in our Brooklyn studio rental space to produce a piece just in time for NYC Pride focusing on the gender-fluid future. In this photo series, they embrace the wide gender spectrum by highlighting 18 creative individuals with an interview for each to share their unique stories and the mark they continue to leave on the community. This hyper-colorful shoot explored these personalities with minimal lighting and the use of mostly found objects that the crew repurposed to use for their amazing set. There was definitely a fine line between retro and futuristic elements used to create the overall aesthetic on our Soundstage. 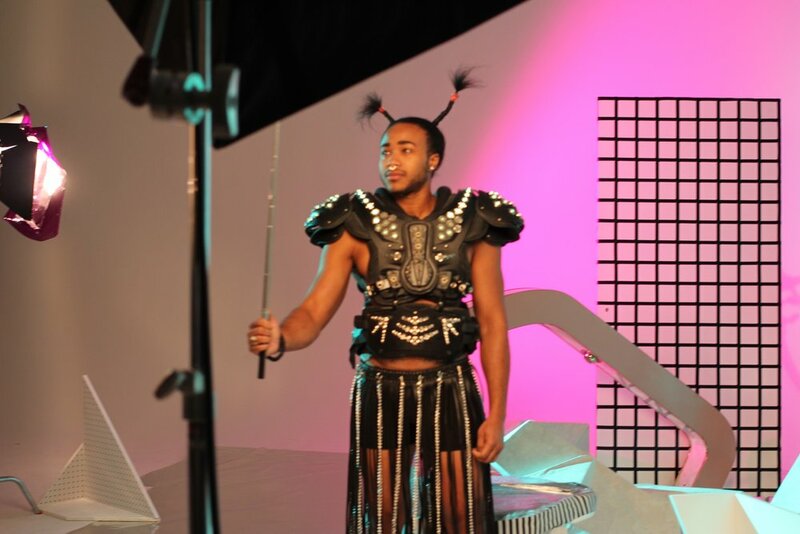 The layering of this DIY set with the over the top costume design really made this project pop in a rather exciting way! Check out the full story here.